"I watched everything and saw nothing.....How?!!" WHAT can i expect from rooster's close up magic? Close up magic is exactly as the name suggests. It is magic that is performed directly underneath the eyes and noses of your guests. This is one of Rooster's favorite forms of interaction with his audience. It creates an immediate connection with your guests, giving them amazing moments of magic without smoke and mirrors or camera trickery! Rooster has had the pleasure of performing Close-Up Magic all over the world, entertaining wedding guests in Brunei to celebrity clientele in Luxembourg. Rooster is known as being one of the best Close-Up Magicians in the country. His form of Close-Up Magic has been created and tailored to give the maximum wow factor for you and your guests. When hiring Rooster for your event you are not investing in your average magician. The experience he creates, making sure everyone is involved, using spectator's personal items (such as jewellery, mobile phones and even personal thoughts) put Rooster head and shoulders above other performers. All of these performances are 100% guaranteed to leave your guests with amazing souvenirs, and a stand out memory of your event. Most certainly! 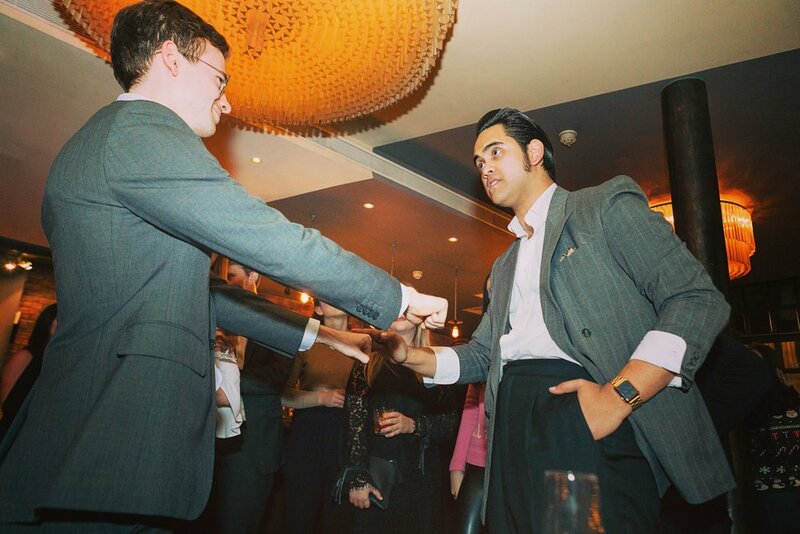 Anywhere in which your guests are gathered, sat down at tables, at a drinks reception (for example) or just generally mingling, Close-Up Magic would be perfect! Rooster's slick delivery and flawless patter will see him mingle seamlessly among your guests. It has been cited as the purest form of magic and Rooster will take your guests on a great ride from start to finish. iPad Magician Booking Worldwide for your event! Breaking the ice as well as keeping your guests engaged and entertained are crucial in creating the right atmosphere for your event. Digital Magician Rooster will guarantee that your event is remembered for a lifetime! Rooster is one of the UK's leading technology and tablet magicians. Can you imagine being able to incorporate mind boggling visual digital magic into your event? Well this is what Digital Magician Rooster can do for you! Whether you have a corporate event, product launch or trade show Rooster can work with you to produce the most visually entertaining show possible, leaving your guests in awe and amazement. Rooster works with both the Apple iPad (amongst other Apple products) as well as Android devices to bring you the most visual and entertaining in Digital Magic. Imagine being able to create bespoke Digital Magic for your brand or event! Rooster can work closely with you to ensure his use of digital technology can enhance your event to the fullest. Rooster can use both the iPad Mini and smaller Android Tablets within his working Close Up repertoire, so be sure to ask if you would like to see these digital miracles when using the booking form. Working alongside the latest in Apple technology Rooster is able to create some amazing miracles just using the Apple iPad! Imagine objects, such as money, spectators personal items and even mobile phones, being pulled in out and of the screen. As well as this objects can appear to morph and change within the screen, only to find out that it has become a reality in the real world! As well as creating magic with tablets, Rooster is well known for making unbelievable magic with mobile devices! Constructing magic using something so personal as a spectators mobile phone, leaves an even more impossible element to your guests experience. Everything Rooster performs has been tailored and created in such a way to allow your guests to feel at ease with him handling such personal items, whilst leaving them completely stunned by the technology they carry in their pockets! Watch this social media video to see how Rooster works in conjunction with Apple and Google to vanish the Brandenburg Gate in Berlin. In an effort to stay unique and versatile Rooster has learnt to create using both the Apple IOS and Android platforms. Working closely with many Android Tablets Rooster transforms his spectators perceptions of technology. By making the seemingly impossible real, altering the fabric of reality or even reading their minds, Rooster can leave your guests dumbfounded and giving your event the stand out memory it deserves. "We booked Digital Magician Rooster for our Christmas Party. As a company using technology constantly, we felt adding Rooster to the nights proceedings was the perfect marriage of tech and astounding magic! He really messed with everyone's heads (even those of us particularly tech savvy), and left us amazed! We will be booking him for our next event." "I hired Digital Magician Rooster on behalf of a haemophilia research charity for a conference attended by mainly healthcare professionals. He went down a treat! He blew everyone's mind and worked really well within the context of the evening agenda. I would highly recommend him if you are organising your own conference or work do."